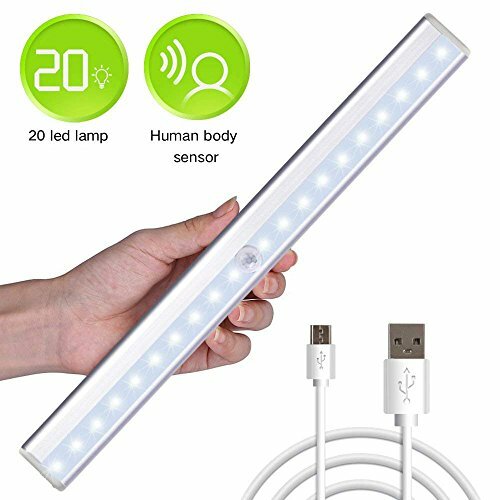 Replace your outdated wall lamp which has to manual switch On/Off every time with this upgraded intelligent(Auto ON/OFF) magnetic motion sensor light for home.Let lighting become more convenience for daily life for family,like when get out of bed at night and go to washroom,kitchen,or pass by hallway,take the stairs safely.Even for outdoor yard,garage,stairwell,carriage,corridor,workshop,basement,doorway,shed.Light any dark places where need a security illumination. ON: Constant Lighting,like a flashlight,no motion&light sensor feature. 3 Adjustable Light Modes: OFF/ON/AUTO, Instant On/Instant Off can be used as normal night light, Option AUTO motion sensing without needing to turn on/off lights in dim light or darkness.Auto-on within 10 ft, auto-off after 12-18 seconds of no motion detected. Easy to mount:1 magnetic strip with adhesive is availble.Wireless to remove and replace.Use it anywhere you need a light without needing to turn on/off overhead lights and leaving one in the dark. Ideal for your bedroom, wardrobe, closet, cabinet, basement, workshop, kitchen cupboards, bookcase, shed, garage, hallway, kitchen, sink, corridor, attic, car, gun safe, vanity mirror,stairway, laundry, drawers, steps etc.almost anywhere you want. Lights your life, greens the world. If you have any questions about this product by Rayhome, contact us by completing and submitting the form below. If you are looking for a specif part number, please include it with your message.